I first got into music when I was an early teenager. I had this big epiphany in my head that I would help change the world in a major way through my art, soul and music. I still have that vision and that is what keeps me pushing with music. I also just like to express myself and connect with audiences of all kinds. The biggest surprise to me, growing up as an artist, was learning how corrupt the industry really is. As a young teenager I was quite naive and blind to the fact. But now standing here as a 23 year old and having the experience I have had, it’s made me a better artist and a stronger person. I have grown so much and feel more mature with the music I now make. I’m here to keep doing what I love, to be the best I can be and see where it takes me. My biggest challenge to date is probably to get back up from every knockdown and low motivational blips every artist goes through. Whether it’s creating music or trying to “make it”. We all have our highs and lows but when you feel down, the best answer is to pick up a pen and a pad, go into the studio and create that music which has soul resonation. Our band consists of me “Mulleezy” & “Vee Da I”. We have been together since November 2008. 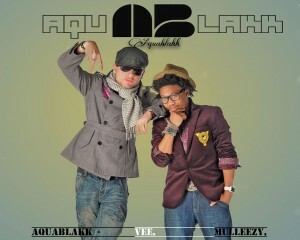 We have always tried to push AquaBlakk across all boundaries. We both have different styles which compliment each other so well on the record and on stage. If you ever come to a live show, you will see that we are all about energy and making the people feel good! Our music has no set genre. We don’t like to box ourselves to anything other than to make good music. How we write lyrics is all to do with the music first and foremost. Vee is the producer of the group. So we could some times go into the studio with nothing in our minds. Create that right piece of music and the concept for the track will straight away come to us. Some times we might already have the idea in our head and we will be looking for the right piece of music. Either way. As long as heart and meaning goes into the song, the outcome is beautiful. Inspiration comes from you, life, people but most of all, the universe. As long as there’s a place in space for me, then I will give back through the art that we call music. We have shared the stage with the likes of Chipmunk, Ironik, Lemar, Neyo and a few others. We have been very grateful and we are still looking to gain many more of these experiences. Our first ever single we released went straight to number one in the independent charts. That is also another great achievement we are proud of. We hope to keep making music for as long as possible doing what we do best. Life is short so we intend to squeeze it till the very end!